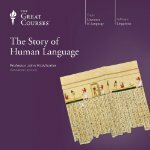 Very interesting lecture – (I’m treating these Great Courses audios as “books”). I have a good background for it due to ESL theory and I thought it was kind of basic for the first several chapters,. but then McWhorter got into language families and language diversities in Chapter 8 through 11. My background was as needed for effective ESL teaching. This is a lecture so the tone is a bit different from a normal nonfiction reading and McWhorter has an excellent voice for a lecture. The discussion includes the myriad of ways all languages change and htat writing is its own language. Listening to a Shakespearean play can be difficult because English has changed, furthermore there are no recordings from the 16th century. All languages change like this and have done this over time and sometimes very quickly. Language is basically oral communication first and foremost. Then there’s a section on the proto-European family of languages of which English and the romance languages we are most familiar. The beginning of modern linguistics. Other families are mentioned – of particular interest are the click languages. There are several chapters related to dialects, what they are and drawing the line between languages and dialects – ebonics, or high and low variations in some languages, Chinese dialects and their writing. Creole languages are another matter. English is a weird language and it’s hard for an English speaking person to learn another language because there is no readily accessible language – German is closest probably but … we have so many shared words and borrowings and quirks, many from the French and Norse languages. It’s certainly not a dying language – but that makes it harder and we’re now getting Spanish words. But we are Americanizing the Spanish language far more than we are becoming Latinized. The ebonics / Black English chapter is fun. Lots of fun stuff here – McWhorter is often pretty funny. The subject of invented languages is a whole new ball game. And McWhorter covers more than what I’ve outlined. I really want to read more in linguistics especially by McWorter, but Noam Chomsky is beckoning, too.